Apart from eating, drinking, and lounging around the pool, on board activities on a cruise ship center on entertainment. This is a relatively recent development. As Nieuw Amsterdam Captain Bas van Dreumel explained during a brief meeting with our group of journalists, the modern-day cruising industry really got going when cheap jet travel displaced ocean-going liners. At first, cruise passengers got a bare bones stateroom, cafeteria-style dining in a single, shared room, and some deck chairs for reading, playing cards, or whatever entertainment they could muster on their own. Fast forward to 2013. On our cruise, a daily schedule was printed (“Today On Location”) with a comprehensive list of workshops (“Secure Your Windows 8 PC); music (Liana & The HALcats in the Queen’s Lounge); spa specials, drink of the day, and so on. Literally hour by hour there were multiple options, from massages to volleyball, steel drum concerts to afternoon tea. I recall a cruise I did some years ago, where the loudspeakers never shut up, the canned music was incessant, and the din on board was so relentless that I had to hole up in my rather dreary cabin just to read. Happily, things have dramatically improved. Apart from all the activities, the shopping, the pools, the bars, and the entertainment, this cruise offered what I most treasure – peace and quiet. There were plenty of places all around the ship where I could hunker down and simply enjoy the passing clouds, the rolling sea, the blissful emptiness. But the evenings were for socializing, and our group especially enjoyed hanging out in the piano bar after dinner, where Jimmy Maddox kept everyone singing, clapping and laughing for hours on end. Jimmy is one of those musicians who can play anything, and remembers lyrics to hundreds (thousands?) of songs with no lyric sheet or prompting. I would guess that his true love and background is barrelhouse, New Orleans style rock ‘n’ roll piano, and there was plenty of that to go around. But he also plays a mean harmonica and occasionally hauls out a ukulele for variety. An all-around great entertainer. On one night the big Showroom at Sea was promoting “The Comedy & Ventriloquism of Kevin Johnson.” I’m thinking – whoa! A ventriloquist. How retro. But why not give it a go? It turned out to be one of the week’s real highlights. Johnson is a young (30-something), somewhat rotund entertainer, who became fascinated with ventriloquism as a child. He works with several puppet characters – two large birds in particular – and watching him it was clear that ventriloquism involves much more than the simple notion of throwing your voice. 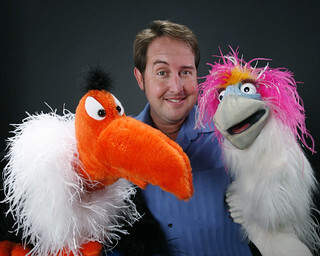 He is a one-man comedy act, playing three different roles at once, with three different voices, while manipulating two different puppets. Hello! And just to complicate things, as if that weren’t difficult enough, he has one or more of the characters sing. Oh, and he does what he calls his Godzilla schtick, taking a cue from the old flicks where the sound track was totally out of sync with the actors onscreen. He replicates that out of sync action live, moving his lips while throwing his voice to one or the other character in a completely different time frame. And when he’s just doing the voices, there is no sign whatsoever that any of them are emanating from his lips, mouth or throat. The man is incredible. I sat down with Kevin a few days later and we chatted at length about his unusual career. He began learning the trade at age 9, performing at 13, and working his way through college using his skills. It was never intended as a full time career. Part puppetry, part stand-up, part schizophrenic sketch comedy, ventriloquism really must be seen live to be truly appreciated. Who knew there were ventriloquist conventions? Johnson admits, with a chuckle, he finds them a bit scary. ”Some of these people absolutely think their characters are real. They take them to restaurants! They drive around with them in their cars! !” The day that I go that far, he says, I’ll go get a real job. 'Cruise' and 'Entertainment' are inseparable. You need core entertainment when you have paid for a luxury trip.